#403 Stranger Things; The Upside Down! Maybe you've seen it, maybe you haven't. But one thing is for certain; Stranger Things is downright AWESOME. Interdimensional travel has been a topic of discussion from scientists for decades. Is it possible? What's on the other side? In the show Stranger Things, we see a dimension of pure death. It's an eerie, unsettling and unforgiving place called the Upside Down. 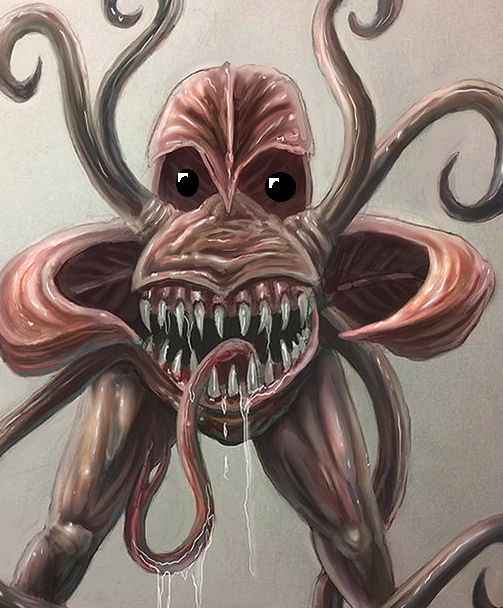 The Demogorgon is just one of several creatures we see in the show. Your job is to create your own creature from The Upside Down world. Do not redesign what has already been made for the show, instead, show US what might still be in there! Just some really loose sketches to get the juices flowing for this project. I love this series! Great topic! Very nice, Tyrus! I still need to see the last episode of season 2. What a great two seasons so far! Common where's everybody at? Drop some sketches or wips at the least! Bobby Rebholz: Again dope topic man! This show is really good. I wish I had more time to get into it; one day I'll play catch up with it. Here's my second final entry. Hope you all like. I really enjoyed making these images and learned a lot as always. @Lege1 That is really cool! Love how realistic it's looking especially for traditional art! One thing that bugs me a bit is the top fleshy 'leaf' bending like that makes the darker backsides of the 'leaf' look like the creatures eye sockets, so when i look at it, it looks a bit goofy. Here's a pic of what I mean, but I mean it's just a sort of illusion. Other than that, it's really awesome! Keep the flame burning Lege1! The first one really has the feel of the thing in the atmosphere in Season 2. Kind of has an ethereal dragon feel to it too. It still feels a bit loose though. I might suggest picking a choosing on the tentacles to give it a stronger silhouette. On the traditional one, it have a sort of B-movie style that you could see it as a rubber suit for poor hunched over actor (They wouldn't even need a suit over their legs!) I wonder what it would look at a quarter angle and if the anatomy would hold up, I'm not 100% sure where some of the tenacles/petals? would connect. It definitely has the plant meets man feel that I got from the Demogorgon too. I did a few more refined sketches, working off Scorge's advice. Anyone out there can give their thoughts on them and I'll probably pick one out and work on it more soon. Well I had the time to start a design from the sketches. I built it up from a photo paint-over on the background to help me with perspective a bit. aamatniekss: Thanks for the critique and this one is completely from imagination. I often do studies on the side of still lifes and people studies that I keep personal and then really try to push the barriers with working from imagination to see if I learned anything from my studies. So far it looks like things are paying off slowly but surely. Also, the only thing traditional about this piece is the pencil sketch. I digitally rendered it out. It has been a long time goal of about ten years to get my digital work looking traditional. I have finally started to get the painterly look in my work I have always wanted, and also have sped up the time it takes to make an image while still maintaining good quality. I See what you are saying about the illusion eyes; I'm happy with it either way honestly. Tyrus: Thanks man and definitely trying to keep the flame burning. I love COW and really want to see things continue on. I've always dreamed of doing something with my digital work career wise and have never had the opportunity, so I still live by the idea that maybe if I'm good enough something will happen before this life is over for me,lol. I just keep pounding work out trying to get better and better, and it helps with my tattoo work which is what I currently do to make a living. I've actually never watched this show that this topic is based on this week. I have just watched some Youtube clips and to get a feel for things. I'm glad to have a likeness of any sort with my pieces because I really felt like I needed to watch the show to be in the know with this. I think that's why this weeks entrys are so slow. Either way, I hear it's a good show and I look forward to watching it one day. My life is just art and work. The dragon feel is what I was going for on the first entry, I wanted an ethreal and mysterious kind of feel. I was going to hide it in the clouds more but know that COW likes us to show out as much of the creature concept as possible. The traditional one is only as traditional as the sketch I did on paper and then took a picture of it and digitally rendered it out. Just like I stated above that I have always wanted my digitla work to have a traditional look. Your idea of the suit actually would work really great and probably be very effective in a low budget scenario like what alot of stuff seems to be on the Sci Fi channel. The suit could be very cool with some latex and airbrush work. Quarter angle would definitely be cool for this concept, I just wanted to do something straight forward, I really don't know why. Yeah the Demogorgon feel is definitely what I was going for here. I'm pretty sure all the anatomy could be functional especially if I put more thought into than I did. Tyrus - some really nice exploratory sketches to kick start this topic off, love seeing these and I really liked the bat creature that seems to be sat atop a telegraph pole, such very creepy place to put a creature like this, it also seems to have the most Stranger things feel to it. In your second batch of goodies I really lean towards the first one, although the other all have their merits too, the second worm creature is really perfect for the show. I see that you've decided to work up the first which is the one I prefer and it looks great in that pose the perspective looks great and the angle helps give unease. looking forward to see it fleshed out some more. Lege1- I thought your creature has too much of a dragons head feel to it and I also thought that the tail gives the indication of being the top back ridge of the beast and then the neck doesn't look like its twisted round to look, it seems as if the chin of it is actually naturally above its chest which make it feel like such a odd anatomy . I love the rendering you have done and the wavy tentacles you have given it, defo has a dark evil air about it. So impressed you did a traditional image too, although I forced to agree with aamatiekss they doo appear to be eye sockets and seem to draw attention to that space more that it ought to , maybe if the tip didn't overlap the mouth pod it would work better, nice colouring to it. like the way you paint, is it all 100% opacity with a basic round? EVERYONE seem to love the Stranger Things series and to be frankly honest I am not a great fan of the show, I just think the story arc feels so disjointed, watched the first series thought it was ok and have only got halfway through the second but frankly when I put it on I usually end up sketching away and not watching , it doesn't hold my attention. I decide to NOT go for a peeling banana face that the show seems famous for instead I took the name of the mysterious other world the upside down and tried to give myself that as a start point. Also its suppose to be eating Dart that pollywog creature that Dustin adopted and soon outgrew, I just got to the part in the scrap yard bus when that get attached by several dog type things, not watched further than that. managed to a basic start on the painting, trying to work some values and forms, still have a long way to go, but any advice and cries would be most welcome. do I need to work my value range some more? whats a good way to learn value painting? I feel like I have gone in too soon with the rendering and I ought to have worked the shape a lot more, perhaps more solid backs by blocking some of the values would help? what do you think? the front mouth needs some shadows from the leg across it to help suggest its form and `I thing a strong ground shadow would help make it feel heavier. Really I think I should have picked one mouth and aim to make that the first focal over the secondary one at the moment they are both equal. Gee, what would you call that thing you drew? It's pretty crazy looking. Err dunno ...Dart Bored perhaps? The work is looking great guys! busy week with holiday shopping but I'm hoping to jump on the next topic, sad I missed this one as I really enjoyed the show this season. Lege, both entries are good but there's something about that first silhouette-based piece you did that I think you could bring to your other work, it looks more sculpted than drawn and the underlying forms have a solid feel (aside from the real floaty bits of course). I'd like to see you experiment more with that method! The second one has some nice texture but it's forms are a little hard to interpret due to the angle. Tyrus, I dig where this is going. I like the unconventional bits of anatomy like the forelegs and the head, they make the creature feel all the more alien. Gee, your rendered image and original sketch are both great! the anatomy feels jumbled and lumped together like the monstrosity of a creature it's meant to be. I have a hard time picturing it in this specific show but it's a great design nonetheless. Stridiggo, this thing is looking really good (forgive me for not typing out the name). the cordlike muscles and the rubbery skin are on brand for Stranger Things, and the way you've lit it works really well too. I do think the anatomy is a little asymmetrical, something I have to work on myself, but other than that very nice! Nice one GEE! Love it! This is probably as far as I'll make it on this one. I wouldn't call it complete, but it was a ton of fun. Another, calling this one "The Overseer". Figure maybe he's the one that runs the show in the UpsideDown.